Martin Denny (April 10, 1911–March 2, 2005) was an American piano-player and composer best known as the "father of exotica." In a long career that saw him performing well into his 80s, he toured the world popularizing his brand of lounge music which included exotic percussion, imaginative rearrangements of popular songs, and original songs that celebrated Tiki culture. 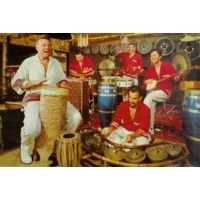 His combo spawned two successful offshoots: Julius Wechter (of Baja Marimba Band fame) and exotica vibist Arthur Lyman.